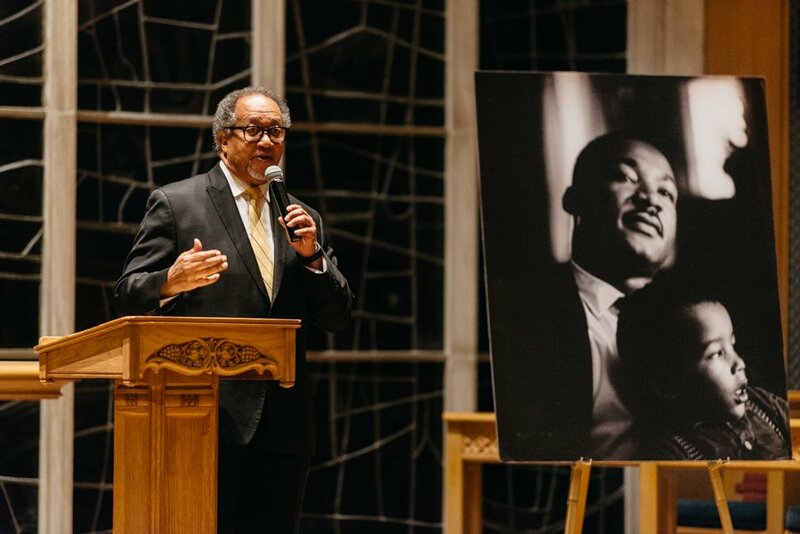 During a Monday night vigil honoring Martin Luther King Jr.’s legacy, civil rights activist Benjamin Chavis Jr. fondly recalled King offering to help him put up fliers, despite his high-profile status. “When you’re a leader, you never ask a follower to do something you’re not willing to do,” he recalled King saying to him. The event, an annual tradition organized by the Alpha Mu Chapter of Alpha Phi Alpha Fraternity since 1980, attracted more than 100 people at Alice Millar Chapel for a night of performances and speeches. As the event’s keynote speaker, Chavis shared personal anecdotes from working with King in North Carolina in the mid-1960s. Chavis discussed links from his past activism to the current social climate. Chavis described workers affected by the ongoing government shutdown as financially oppressed, and said these workers reminded him of protestors from the Memphis, Tenn. sanitation strike in 1968, who were financially and politically oppressed due to their race. The strike was a response to poor pay and dangerous working conditions for black sanitation workers in Memphis. “Political justice has to be accompanied with economic justice,” Chavis said. In addition to Chavis’ speech, the event featured performances by gospel choir Northwestern Community Ensemble and a cappella group Soul4Real. Poet Timothy Mays also performed two spoken word poems, one of which described his life as a constant fight due to his identity as a working-class black male. McCormick senior Paul Ankenman said Chavis’ speech reflected King’s spirit of progress. He said the current social issues Chavis brought up –– such as the proposed wall on the Southern border –– are ones King would have dealt with if he were alive. Ankenman said he found the vigil inspiring because it made him rethink the potential students have to enact change. “It’s important for every student who goes to this school, whether you were at this event or not, to think about the privilege and standing that we have as Northwestern students and how we can leverage that influence to create a more just future that will honor what was accomplished previously in the civil rights movement,” Ankenman said. Weinberg first-year Alex Mitchell, who also attended the event, urged students to rethink the importance behind Martin Luther King Jr. Day. He said it is his duty to respect King’s legacy on this day rather than treat it as another day off. In addition to holding events like the vigil, Alpha Phi Alpha organizes several programs intended to support the black community, said JaVahn Iverson, a McCormick senior and the secretary of Alpha Phi Alpha. Some programs include Project Alpha, which aims to educate young males about sexual health. Iverson, who was also co-chair of the vigil, said that he’s appreciative of how the event sparks conversation about race.